Last night, I was granted a quintessential Peace Corps experience. One every volunteer rather expects when imagining her service in strange lands, foreign abodes, and different climes, but which faded from consciousness rather quickly after I fortuitously dropped anchor in the pseudo-suburban dwellings of my training and assignment villages, with their multi-floored units, double-paned windows, and tightly meshed screens. 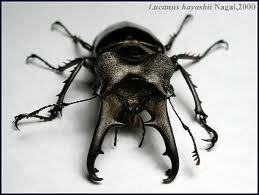 I had let my defenses lapse; I wasn’t prepared for the WHIRRING BLACK HORNED BEETLE ENCOUNTER…. It is past 10:00pm when I finally shut down the computer, turn the fan around to cool the bedroom, and flip on the overhead lamp. Two steps into the room I register the whirring of a helicopter buzzing toward the light. (I swear I feel its rotors graze the topmost hairs of my head.) Startled, I jump back to the perimeter, sheltering in the doorway, performing a quick scan of the airway. My eyes lift and lock on a freakish black mass the size of my big toe furiously slamming into the Japanese paper lantern hanging innocently above my bed. 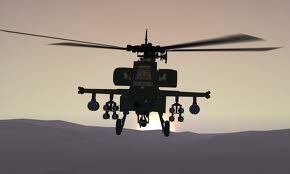 It takes a couple of seconds to register…that’s not a helicopter, it’s a freaking BUG!!! As loud as a helicopter, almost as big as one of those toys my 40+ brothers still obsessively play with on holidays – but this is no flimsy, plastic, remote controlled whirlybird, this thing is seriously ALIVE! With my heart slamming in my chest, I blindly grabbed for the door handle behind me, poised on the tips of my toes to bolt from the doorway if it changes direction. What to do, what to do, what to do??? No husband, no roommate, no mama gazda will respond to my bleating SOS. I don’t want to take my eyes off it, give it the opportunity to find cover, chance losing this down-sized Star Wars Rancor somewhere in my sleeping chamber. Meanwhile, he continues to mercilessly slam the paper lantern, whirling in dervish circles, up and around, tumbling and pivoting, bam! Thud! Wham! In the crystalline second it dawns on me that he is helplessly caught in the current of air blowing forth from the fan, Rancor inexplicably plummets from view. I run pell mell for the broom. Well, this standoff has to be brought to a head somehow: make a move Brave New Woman! You’re the one gloating about living alone. Deal with the consequence, baby. Summing every vestige of courage I can mop up within me, I sally forth and swat – take THAT ye demon – each fine hair on my body stiffly alert, prepared for combative reprisal. 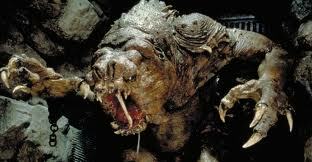 I succeed in knocking Rancor to the floor. 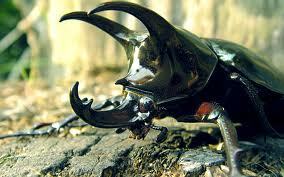 Hovering, keeping a good three feet between us, I peer at his armored hide, noting his serrated claws, the horn he must have lifted from a rhino, the multitude of hairy appendages protruding from his steel-plated body. No wonder he whirred. This is not an insect, it’s a drone, a veritable military assault helicopter, designed to evince shock and awe, to inflict terror and damage on its stricken, limp-limbed victim. Stretching the broom out in front of me, I scoot him toward the kitchen but am thwarted by the door sill (why, why, why do Moldovan doors all come implanted within inch high molded frames?) Now, the beast lies between me and freedom, to all appearances comatose. But I know better. This is evil incarnate, waiting for a lapse in wariness. Performing the highest leap I’ve managed since fifth grade field day, I clear his bristling weaponry and make another dash for the kitchen, securing the long-handled dust pan (thank god for at least one Moldovan implement with a long handle!) I hurriedly unlock my apartment door, fly across the center entryway, flip on the light, scramble to unlock to outside door and fling it wide, then race back to the bedroom doorway, where my foe remains fiendishly feigning rigor mortis on the tile before me. Giving myself no time to ponder best tactics, I boldly reach forward, wincing, and scoop the tank-like thing up – his passage is audible, metallic, like a size 10 wing nut skittering across the floor – and then utilize the broom bristles to pin him savagely to the bottom of the dustpan. I flee with captive held out arm’s length in front of me, almost tripping over the front door sill (damn those things!) and fling the beast out into the murky darkness of the rain-spattered courtyard. I hear him thud down the steps in front of me. Hightailing back inside (if I had a tail, it would be firmly between my legs) I slam the door, locking my thwarted nemesis out in the night. It takes a full five minutes to stuff my heart back where it belongs. Only now does a vestige of rational thought come creeping back, the tickling awareness that I may have only dispatched a front running scout. Perhaps there is a lurking company of soldiers – lord almighty, maybe even an entire battalion – waiting in the wings, plotting my downfall, clacking their pointy jaws and waving their snipping pincers in glee! Where in the bloody hell did that monstrosity come from? How did it gain access to my bedroom? There are three vents (which I imagine to be useless, leading to nothing, since this building’s heating system is operated through wall-mounted radiators and air-conditioning is a pipe dream) but all are covered by ceramic screens with openings barely larger than the tip of my pinky – Lieutenant Rancor did not worm his way through one of those pinholes. There comes the line of thinking that truly makes me shudder: did this intruder attach himself somehow to my clothing? Hitch a ride like some latter day Trojan inside the swirling panels of my floor length skirt? Or did he clamber like a pirate into a crevice pocket of my backpack, tricking me into slinging him over my shoulder and giving him safe harbor within my personal belongings? Or worse yet – did he claw his way out of the shower drain, poking his tentacles up from the sewer periscope-like, assessing both occupancy and opportunity in one stealthy search? I realize I may be a bit overweening here. Having just read a nightmare account of fist sized spiders in a pitch black outhouse that far exceeds my piteous-in-comparison skirmish with a venom-less beetle, I really have little justification for parading my tiny bravado. By I did allow myself two OTC sleeping pills to calm myself into slumber. And in the morning, when I tiptoed out to the courtyard to snap a picture of my conquered foe? A great stretch of damp brickwork lay before me, littered with the detritus of storm, not a corpse to be found. He’s out there, somewhere. Waiting.